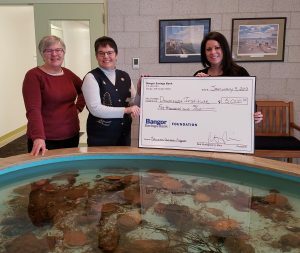 Molly Erickson, right, Manager of the Machias and Jonesport branches of Bangor Savings Bank, presents DEI’s Executive Director Dianne Tilton and Board Chair Lynn Alley with a check for $5,000. BEALS — Bangor Savings Bank recently awarded a $5,000 grant to the Downeast Institute’s education program. The funding will support DEI’s educational iniatives such as Marine Science Days, which provides hands-on science and math instruction to local students through exploration of the natural environment. Bangor Savings Bank is a state chartered Maine and New Hampshire bank headquarted in Bangor. Founded in 1852, it has 58 branches across Maine and New Hampshire. The bank contributes to the health of Maine communities through the Bangor Savings Bank Foundation.